Finally it's Friday and I have the day off. Nothing better than a 3-day weekend too! Today I made a Wobbly Tent Card. These are super fun cards to make and super easy. I found the tutorial from Splitcoast Stampers site. I added a wobble to my balloons of course the balloons need to look like they are flying right?!! 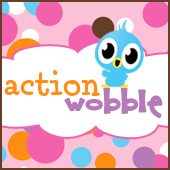 So who is going to get caught wobbling today! Is it you..